I moved to the country about 20 years ago. I wasn’t sure whether I was going to like it, having lived in the suburbs most of my life. Much to my surprise, I fell in love with this area, its vastness, beauty, community spirit and the freedom we have to roam and explore. I feel like I can breathe here. Country life isn’t for everyone, and this post is not meant to wax poetic on the joys of country living. But I do believe that in today’s urban culture, we have become separated from the land that sustains us physically, emotionally and spiritually. We have moved from a society of hunters and gatherers, to producers and manufacturers, to knowledge workers who use screens and devices to do our work. What toll does this have on us as human beings? Have we lost basic skills of survival? Have we lost a respect for our land and its sustainability? Have we suffered spiritually or emotionally from not being firmly grounded with terra firma? I don’t know the answers to these questions. All I know is when we drive back from Toronto and pass the final townhouse in Oshawa and see the open fields, I sigh a big sigh of relief and rejoice in the sights and smells of the land on my way home. 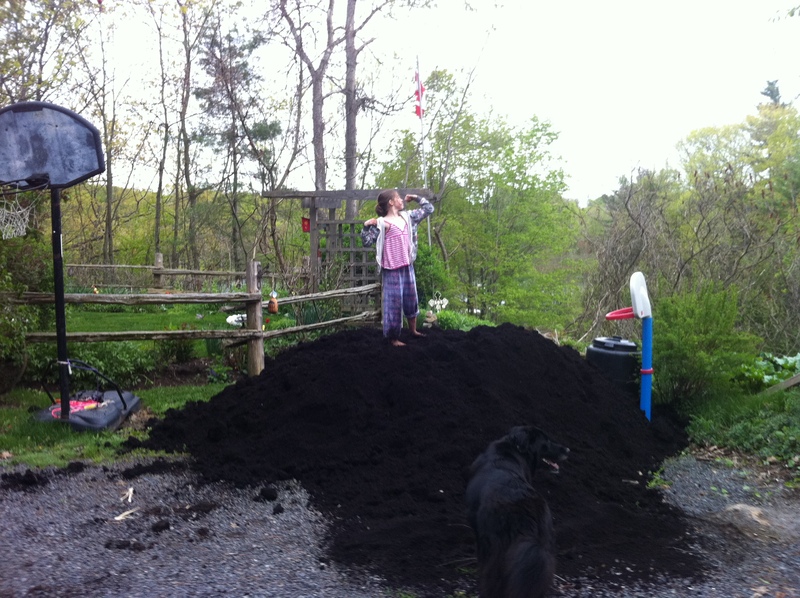 This week’s Happy Act is to get your hands dirty and plant something. Saturday, May 3 is Community Tree Planting Day in Ontario. I’ll be planting trees twice this week. My kids’ public school is having a work bee to build a new garden as part of the school’s Eco Schools initiative (a big shout out to Union Gas for donating $1,000 and volunteers to help with this project). 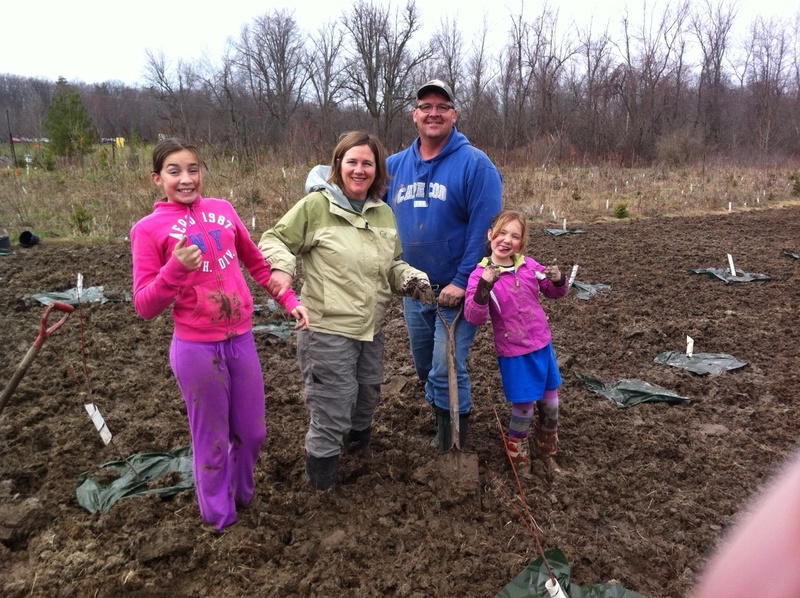 On Saturday, my entire family will be at Lemoine’s Point Conservation Area planting trees for the Cataraqui Conservation Area. If you go to the Trees Ontario website, you can find out where you can plant trees in your community this Saturday. NOTE: Apologies for the late post this week for you Sunday morning regulars. Our home internet was down for the last five days–country living! 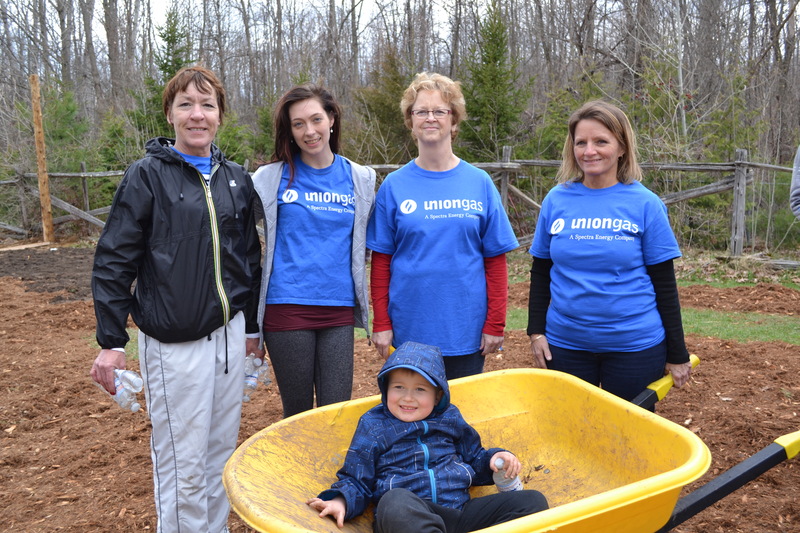 Here’s some pictures from the tree planting: Volunteers from Union Gas with a young helper, and my family at Lemoine’s Point in Kingston. I agree with you on so many levels!! That being said, I live and work in an urban environment. But as I drive along the QEW everyday into Mississauga, I always take a moment to gaze out over the Credit River bridge to catch a little glimpse of nature (Should have my eyes completely on the road but this small moment has become important to me). I am also thankful to live close to the Bruce Trail and getting out for a hike is always a highlight for me. I think that people can experience such a thing as “nature deficit”. Luckily there is currently a movement in Kindergarten towards exploring nature/discovery learning – definitely one of the assets of full-day Kindergarten! I think it’s great nature and discovery is making it’s way into the school curriculum and the neat thing about feeling grounded, literally, is you can do this anywhere. On that last trip back from Toronto, we saw deer grazing by the credit river off the 401!